Bibimbap will always remind me of Ashley, (who was my roommate from college), hangovers, and California. You see I did my Masters of Fine Art at the California Institute of the Arts (CalArts), in LA, where I lived with Ashley for 3 years. It became a routine that when we had our typical beer pong type hangovers we would go to this tiny little Korean restaurant where Ashley would order a sweet and savoury soup, and I always opted for bibimbap. So it was due time I bring this dish back into my life and make Vegan Korean Bibimbap. 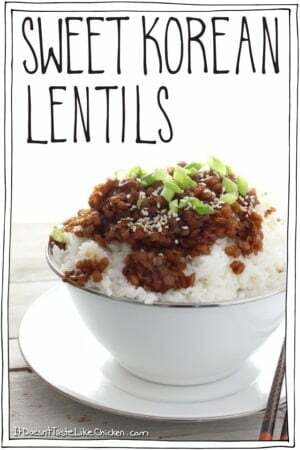 Now, of course, this dish isn’t actually traditionally Korean as lentils aren’t used in Korean cooking, but I’ve used all of the same flavours to get that amazing Korean vibe. 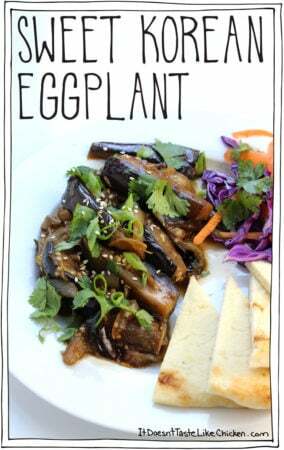 I use my recipe for Sweet Korean Lentils, and my Vegan Toast Dipping Sauce (which is like an egg yolk). Then just sauté up some spinach, grab a jar of vegan-friendly kimchi and pair it all together on a bed of rice with some fresh carrots and cucumbers. Let’s just say I polished off this giant bowl of deliciousness in record time. I’m so happy to bring back bibimbap comfort into my life again (hopefully enjoyed without the hangover). The sweet and savoury lentils, spicy and tangy kimchi, and the rich egg yolk sauce make this dish total mouth heaven! 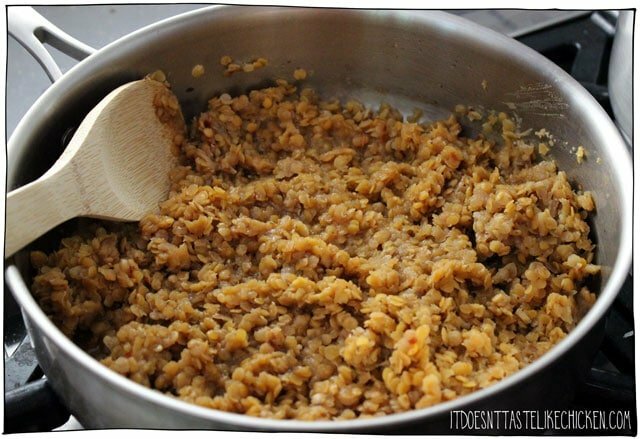 To make Vegan Korean Bibimbap: prepare the Sweet Korean Lentils and Vegan Toast Dipping Sauce according to the directions. These two dishes along with the rice can be prepared ahead of time and reheated before serving if desired. 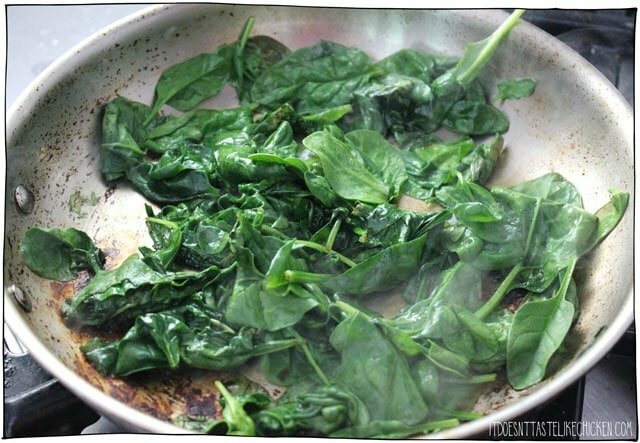 To make the spinach, add the sesame oil to a skillet or frying pan and put over medium heat. When hot add the spinach and soy sauce. Stir and cook for 1 – 2 minutes just to wilt the leaves, don’t overcook. Remove from heat. 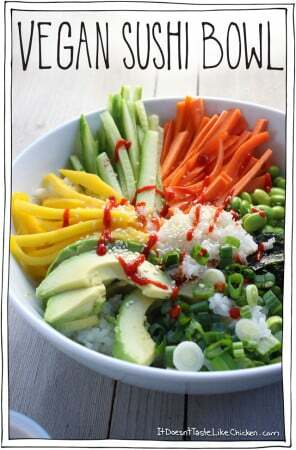 To assemble the bowls, divide the rice evenly among the bowls. 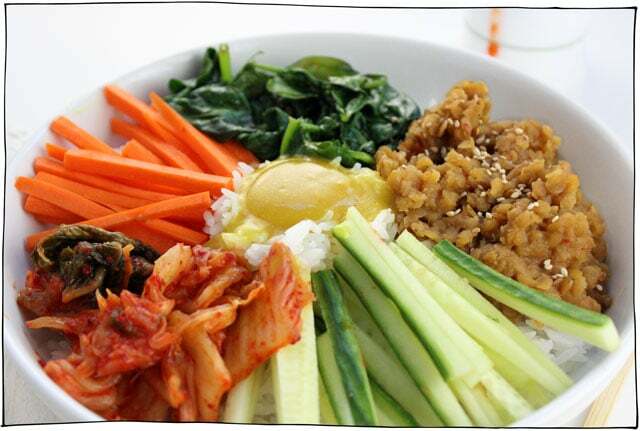 Follow the rice with the Sweet Korean Lentils, cooked spinach, carrots, cucumber, kimchi, and the drizzle the Vegan Toast Dipping Sauce in the middle of the bowl (or anywhere that you want it, omnomnom). 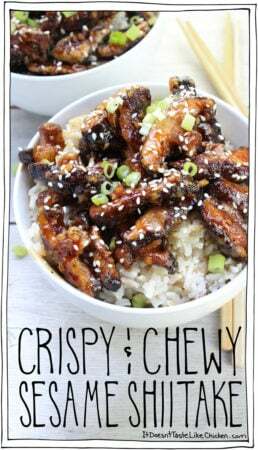 Garnish with sesame seeds and hot sauce if desired. 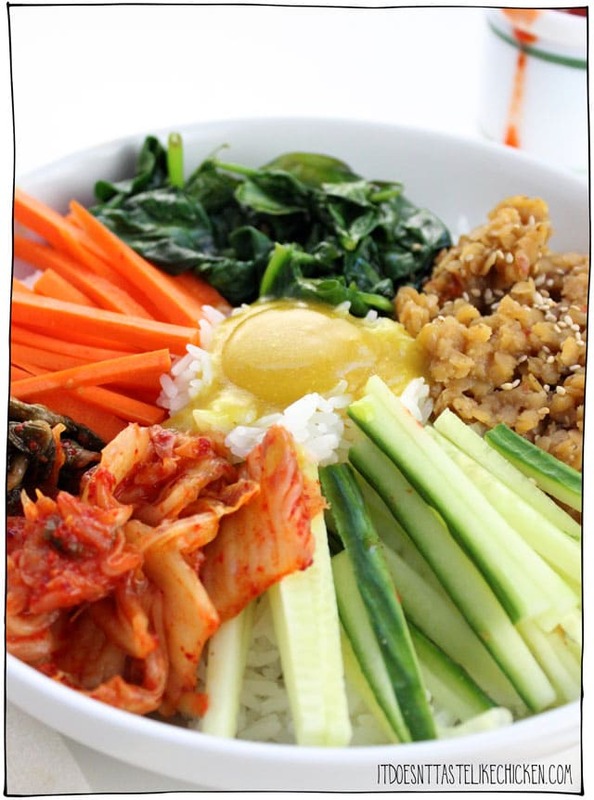 Vegan Korean Bibimbap with a vegan egg yolk! This Korean inspired vegan bibimbap is full of flavour with sweet and savoury lentils, sautéed spinach, kimchi, fresh carrots and cucumbers, and a rich and easy to make vegan egg yolk sauce. 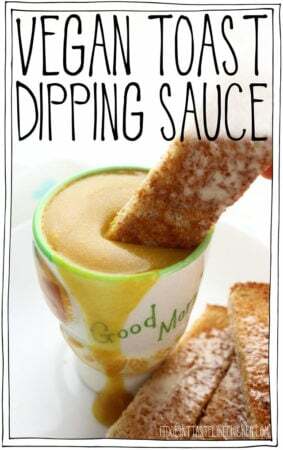 Prepare the Sweet Korean Lentils and Vegan Toast Dipping Sauce according to the directions. These two dishes along with the rice can be prepared ahead of time and reheated before serving if desired. To make the spinach, add the sesame oil to a skillet or frying pan and put over medium heat. When hot add the spinach and soy sauce. Stir and cook for 1 - 2 minutes just to wilt the leaves, don't overcook. Remove from heat. To assemble the bowls, divide the rice evenly among the bowls. 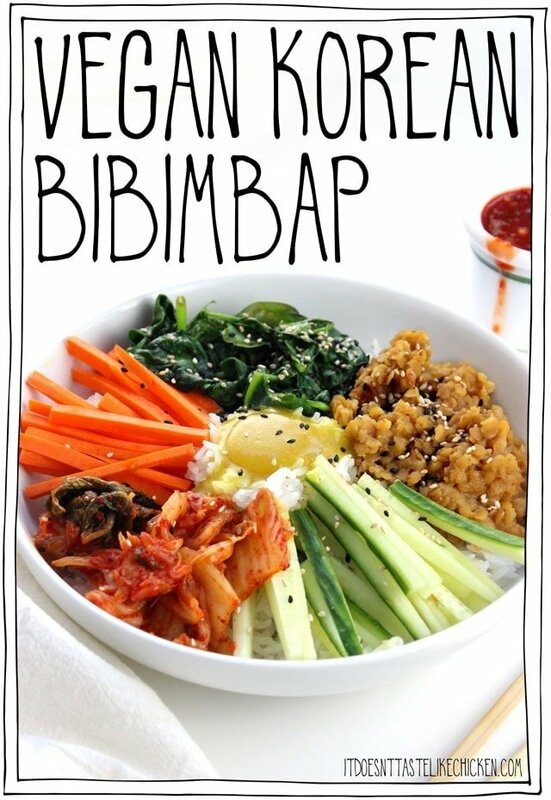 Follow with the Sweet Korean Lentils, cooked spinach, carrots, cucumber, kimchi, and the drizzle the Vegan Toast Dipping Sauce in the middle of the bowl. 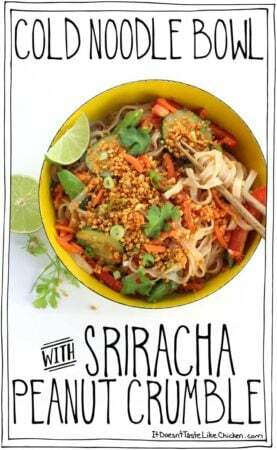 Garnish with sesame seeds and hot sauce if desired. Haha, yeah… it wouldn’t be the first time. Turned out amazingly, as your recipes always do! I love Korean food! I tried the recipe and it was fantastic. 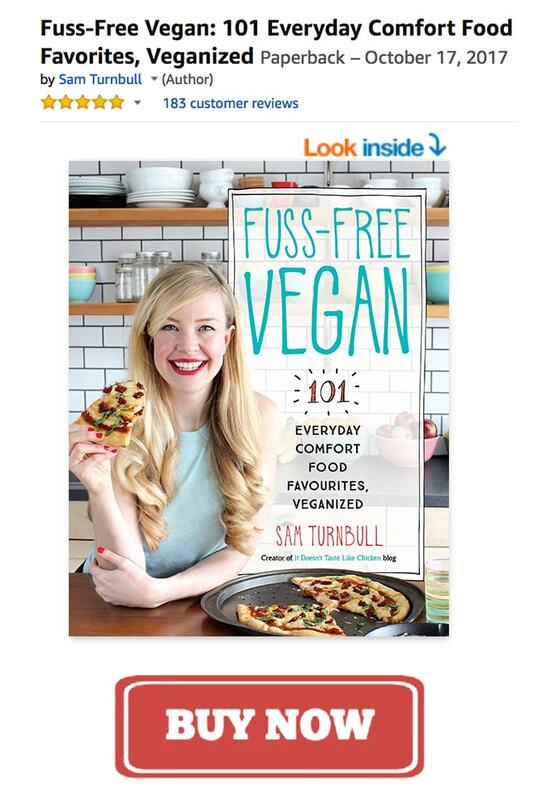 Thanks for motivating me in the kitchen! Looks terrific. How’d you make the :egg: look round and hold it’s shape? I am wondering that, too! When I was setting up for photography the egg yolk sauce cooled down a bit and when I spooned it on it just kinda did that! My sister married a Korean in 1975! So, I’ve been eating Korean food since then, and Bi Bim Bap has always been a favorite. And Jap chae, and sahm, and…..Can’t wait to try it with the dipping sauce. For me, the egg yolk was always an important part. I’m so glad Korean food is so au courant right now! I can’t wait to try this! 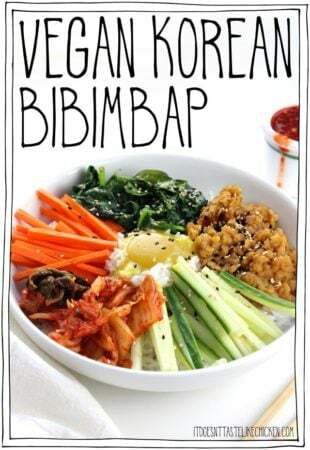 I have been craving Bi Bim Bap, and I’m excited to try the vegan egg yolk! I have the black salt in my amazon cart. Could I marinate the carrots and cucumber with some rice vinegar or other flavors to soften them up a bit? I love the lentil addition for protein. Thanks Sam! Hi Jenn, absolutely! I liked having the break of a fresh veggie as all of the other flavours are pretty strong, but if you want more of a pickled vegetable, then by all means, go for it!